Pivotal Container Service(PKS) integration with Project Hatchway: A technical overview - Möbius Business Technologies Ltd.
For vSphere environments, Project Hatchway offers storage infrastructure choices for container platforms such as Pivotal Container Service so customers can take advantage of container technology for running stateful, data intensive applications such as databases and modern cloud native applications. The solution enables any storage which can be presented as a datastore to vSphere environment (vSAN, NFS, ISCSI, SAN, etc. ), to be provisioned as persistent volumes in Kubernetes or docker swarm. Supported storage offerings can be found on VMWare HCL. Pivotal Container Service (PKS), is a container service offering from VMware and Pivotal to deploy and consume container services with Kubernetes, built with high availability, security and operational efficiency targeting enterprises and service providers. As containers are stateless and ephemeral, they don’t retain any data when they are restarted or rescheduled. However, businesses want to leverage container technology for running stateful and data intensive applications. Kubernetes addresses this gap by offering a persistent storage API. This API abstracts the details of how storage is provided and enables a simple developer friendly way for consuming storage. More details on persistent storage in Kubernetes can be found here. 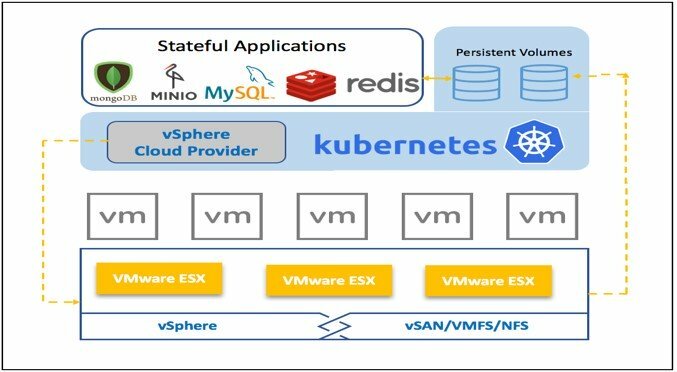 While kubernetes storage API addresses the storage consumption for containers, storage provider details for Kubernetes, running in vSphere Cloud environment are handled by Project hatchway, consumed as vSphere Cloud Provider interface as shown in (Figure 1. Support for vSphere volumes is part of upstream open source Kubernetes distribution through project hatchway. 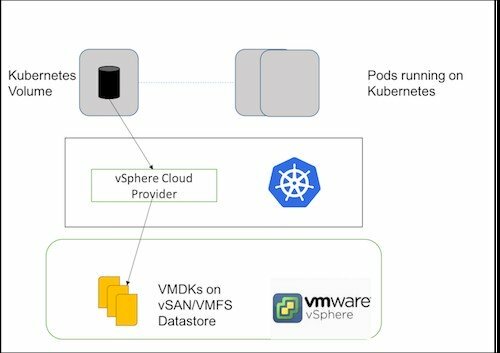 This integration enables the pods in Kubernetes to use enterprise grade persistent storage, similar to how traditional virtual machines leverage enterprise storage such as vSAN. 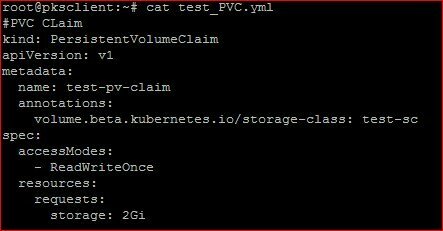 vSphere Cloud Provider supports every storage primitive exposed by Kubernetes: Volumes, Persistent volumes, Persistent volume claims, Storage class, Stateful sets. Persistent volumes requested by containerized applications can be provisioned on vSphere datastores. Kubernetes volumes are defined in Pod specifications. They reference VMDK files and these VMDK files are mounted as volumes when the container is running. When the Pod is deleted, the Kubernetes volume is unmounted and the data in VMDK files persists, as shown in Figure 2. 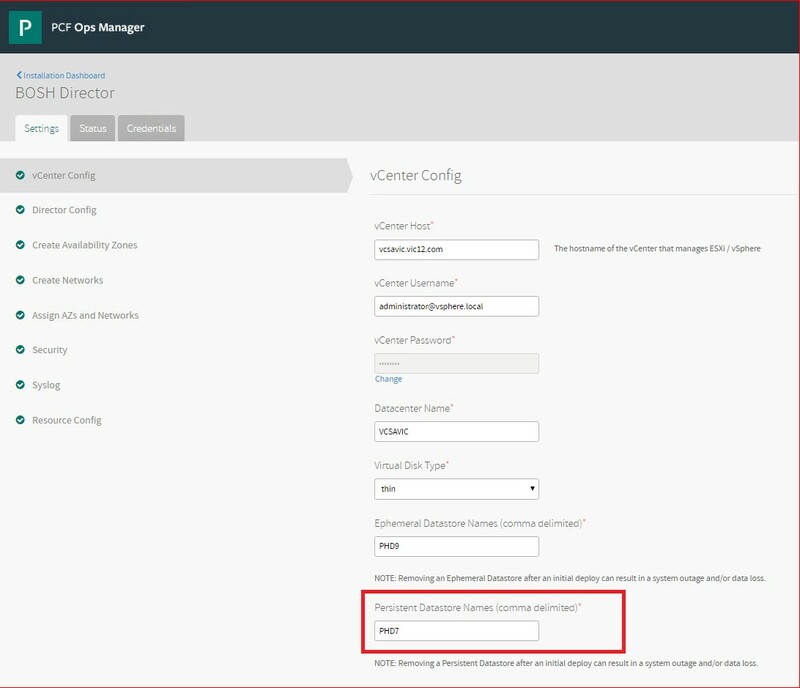 Pivotal Container Service automates and abstracts the configuration in the above steps as part of Pivotal Container Service tile installation via Ops Manager. Once Pivotal Container Service tile is configured, persistent volumes can be created directly on persistent datastore specified in Pivotal Container Service tile as shown below in Figure 3. NOTE: kubectl is a command line interface for running commands against Kubernetes clusters. Log into vSphere Cloud with appropriate privileges for vSphere datastores access, navigate to the persistent volume datastore as described in Figure 3, kubevols folder is located here, under which persistent volumes as VMDK files can be found. The VMDK files are named after the persistent volumes created as above. More details in the Figure 4 below. PHD4 is an example name of customized datastore in the above yaml file. Once Storage class is created, rest of the steps is same as mentioned in the Scenario 1. 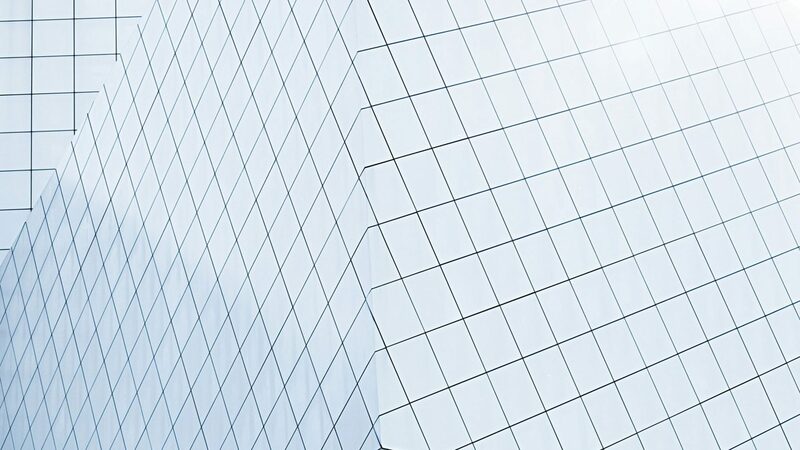 The post Pivotal Container Service(PKS) integration with Project Hatchway: A technical overview appeared first on VMware Cloud Management.